What are the pros and cons of using a cleaning franchise? Before the days of the internet it was pretty difficult to get decent information on how to start a cleaning service. Your only options were to go to a vocational school that was very expensive and slow or use a cleaning franchise which was even more expensive and usually pretty frustrating to deal with. Many of them have had a spotty reputation, they have gotten better - to be fair - mainly because of the open and immediate nature of the Internet. You better have a good reputation or things are going to go sour fast with resources like blogs, search engines, Facebook and Twitter. Thanks to the internet, small business consulting firms like ours began popping up. We were one of the first to offer the exact same tools and education that a cleaning franchise would offer for a fraction of the cost and you could get started immediately. The difference between $10,000 and $380 to start your own cleaning business is pretty mind-blowing when you think about it. We can teach you everything you need to know in less than 6 months--easy! Once you have 6 months of experience under your belt, you are pretty good to go. This isn't a martial art, it is cleaning! Why get locked into a 5 - 15 year contract that limits you in so many way? It may seem like an advantage to have a brand behind you like Janiking, Merrymaids and Mollymaids, and that may be true with some potential clients. However, in my 11 years of experience with my own cleaning business I’ve learned that just as many people do not like hiring a cleaning franchise. I would say one-third of my clients had used a cleaning franchise in the past and were deliberately trying to avoid them. Why? The quality of service is just not very good because the whole focus of a franchise is on volume. As a result of that intention, franchise owners hire cleaning workers for $8 per hour and there is a lot of turnover and even theft. It is unsettling to have different people in your home every week, and unhappy ones at that! 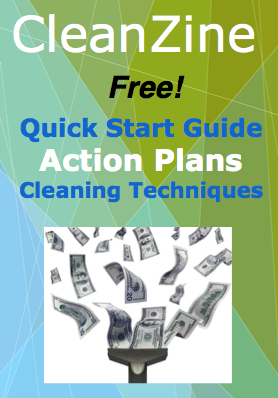 Why spend thousands just to get started when you can learn how to start a cleaning business with the Clean Up Now System for a fraction of the cost? You even get a free cleaning business website! But they get me leads! What about the “leads” they provide you? This is one of the dirty little secrets about cleaning franchises that really annoys me. It’s just not possible to provide decent leads to a franchisee. Again, with the widespread usage of the internet, this gimmick has been largely exposed through social sites and forums. There simply was no way to file any complaint about the fact that these “leads” were worthless, except through the Better Business Bureau which is susceptible to being bought off, as detailed in a recent study of the BBB. So, there were plenty of victims to be had that had no clue that the leads were a marketing gimmick simply offered to make you feel safe and secure. It is much better to find your own unique organic leads than it is to work through a used list of leads. Finding your own leads really scares people who are starting up. I still get emails asking if we provide leads -- this myth runs deep. It’s far better to learn how to find clients that are a perfect fit for you, not a list of 1000 completely random leads. More on this in future posts. You have to do the work of getting leads -- no way around it. In my opinion, the only convincing reason people will still go hugely into debt to a cleaning franchise is fear, and they perceive the risk to be removed by being part of a franchise. I can think of no bigger risk than being hugely in debt before you even start!